Avoid places that ticks are likely to be. Make sure you keep your lawn cut and well maintained. Ticks like to travel through taller grasses and brush and travel on deer. If you live near a wooded area you are more susceptible to ticks. If you are going on a trail, make sure to stay on the trail and avoid any heavily wooded areas. This can also keep you safe from poison ivy and other dangerous plants or bugs. When you go camping or spend any time outdoors in the woods, make sure to use bug spray that is made for repelling ticks as well. Look for brands that contain DEET because this is the most effective when repelling Wear pants, boots and long-sleeved shirts if you can. Don’t forget to spray repellent on your clothes as well. Don’t forget to protect your pets too. Dogs especially are susceptible to ticks and can carry them in your home and infect you. Make sure to give your pets medicine that will repel ticks and check for ticks every time they are playing outdoors in wooded areas. If you have been outdoors in areas that may have ticks, come in and shower immediately. Take off your clothes and wash them in warm water. This can help any ticks that may have come in contact with you to fall off before they infect you. Always check for ticks when you come indoors. Remember, they can be in your hair and other hard to see areas. Ask someone to help you and check them as well. If you find a tick, remove it immediately with tweezers. Make sure to get the head of the tick out first. If you are having a hard time removing a tick or are unsure if you have a tick bite, see a doctor immediately. Lyme disease often takes a while to show symptoms and by then it can be very hard to treat and cause many physical and neurological symptoms. 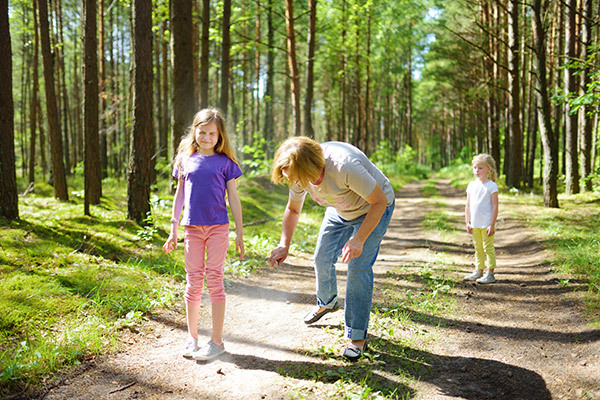 Protect yourself and your family from tick bites so you don’t have to deal with Lyme disease. Lastly, do your research. Look up photos of what a tick looks like so you know what to look for in the woods and on your body. Know the signs of an infected tick bite and the early warning signs of Lyme disease. This could save your life or someone else’s. Have you ever been bitten by a tick? Do you know someone who has been affected by ticks or Lyme disease? Share your story! Please share this article with your friends to spread the word and keep them safe!